Six months ago netbooks all had 10-inch displays, fairly cramped keyboards, and couldn't manage to play a 1080p video even if they trained with the best of marathoners. The world's a lot different now: the King of Pop has passed away, the unemployment rate has dropped, and netbook manufacturers have realized 11- and 12-inch displays provide a more comfortable experience -- especially when paired with more powerful hardware that adds multimedia prowess. 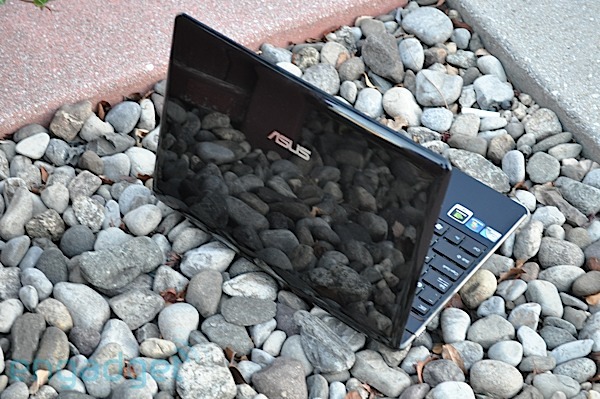 We'll stop there with the Netbook 101, but looking at the past is necessary in realizing what a game-changer the ASUS Eee PC 1201N really is. The 1201N's dual-core Intel Atom processor, NVIDIA Ion graphics, Windows 7 Home Premium, and 2GB of RAM make it the most powerful netbook to ever grace the purchase pages of Amazon. But does the $500 machine fix all the issues and frustrations we've ever had with netbooks when put to the test? Can it make us forget about cramped keyboards, strained eyes and sluggish video performance? Find out in our full review. 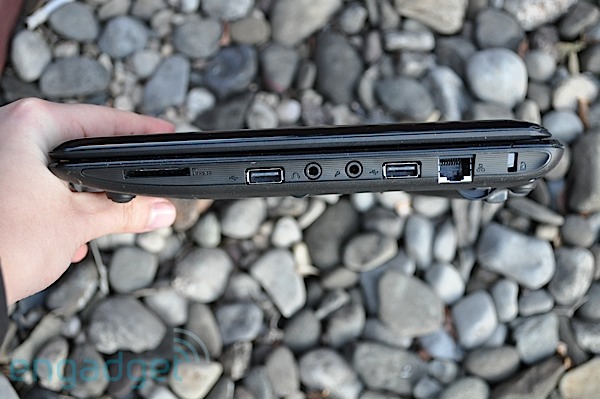 At first sight of the 1201N we got the mental image of ASUS engineers attempting an experiment: deep in a Taiwanese lab the Eee PC 1005HA is placed on a machine, a switch is thrown, and out of the dust appears the wider and thicker Eee PC 1201N. We're okay with the strikingly similar design, and though the lid's glossy black finish is a fingerprint magnet, overall it's a slick-looking machine. (It would be nice if ASUS included a polishing cloth, though.) Our only reservation about the 1201N is that it doesn't feel quite sturdy enough -- unlike the aluminum Nokia Booklet 3G, the plastic chassis doesn't exude a toughness or have us confident that it could take a beating. Wider than 10-inch netbooks, the 1201N is a bit harder to slip into a small shoulder bag (or purse), but it'll travel well in a laptop bag at just 1.2 inches thick and 3.2 pounds. There's also more room for ports: three USB, an HDMI, VGA, and a headphone and mic jack surround the chassis. 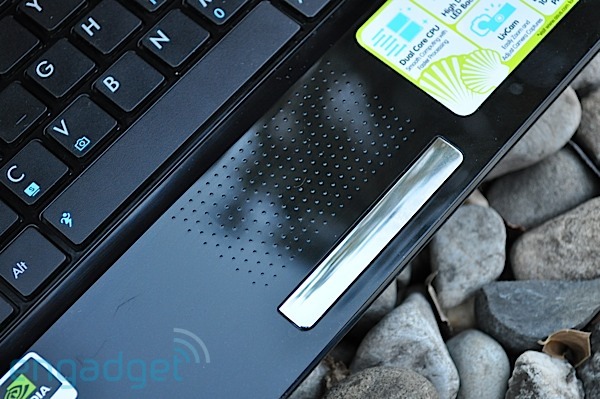 When you open it up, the 1201N continues to be fairly impressive, with a super-comfortable full-size chiclet keyboard. The matte keys have a nice tactile response and the wider deck accommodates two full-sized shift keys. The trackpad is actually flush with the case and only differentiated by a grid of raised dots that feel great on the fingertip. Two-finger scrolling was fairly smooth in Firefox 3, and definitely not as unpolished as recent HP laptops. ASUS's chrome rocker continues to peeve us; it's loudly clicky and the lack of dedicated right and left mouse buttons caused a few mis-clicks. The 1366x768 resolution 12.1-inch LED-backlit display isn't flush with the bezel, but it's still plenty spacious and crisp -- we'd be remiss not to mention how lovely the green trees looked in a 1080p clip of the Amazon rainforest. A word of caution to those who hate glossy screens: the 1201N's screen is reflective enough to function as an effective mirror. Packing a dual-core 1.6GHz Intel Atom 330 processor typically found in nettops, NVIDIA Ion graphics, 2GB of DDR2 RAM, and a 5,400rpm 250GB drive, the 1201N is hot to trot on specs. The dual-core processor provided noticeably better performance than the standard netbook's single-core 1.6GHz Intel Atom N270 CPU -- everyday multitasking performance in Windows 7 Home Premium felt much snappier. The benchmarks back us up: the 1201N notched a Geekbench score of 1,106, higher than both the N280-powered HP Mini 5101's 920 and the NVIDIA Ion / N270-backed Lenovo IdeaPad S12's 826. For comparison's sake, the Intel CULV HP dm3t we just reviewed scored a 1,602, so while the 1201N is powerful for a netbook, it doesn't quite match up to a thin-and-light. Speaking of Ion, the GeForce 9400-based chipset provided a pretty sweet multimedia experience on the 1201N. A series of trailers played back smoothly from an external Blu-ray drive with no pauses both on the 1201N's screen and a 42-inch 1080p HDTV. With Adobe's GPU-accelerated Flash Player 10.1, YouTube HD and Hulu HD were incredibly smooth on the 1201N's screen and over HDMI, but local playback was a little rougher: a downloaded 1080p, H.264 QuickTime video of Miley Cyrus struggled a bit with a few pauses here and there, although it was still watchable. We've never bothered running games on netbooks with integrated graphics before, but the 1201N handled lighter games like WoW just fine. Our gnome was happy to make it to level four at 30fps. The more GPU-intensive Batman: Arkham Asylumn stuttered at the native res, but was surprisingly playable at 20 fps when we lowered it to 1024 x 768. All that performance and graphics gain is great until you realize that it takes a hit on the 1201N's battery life. Its six-cell battery lasted 2 hours and 26 minutes with a 1080p WMV video running on loop, and we got about three and a half hours of runtime using the laptop to just surf the web and write this review in Microsoft Word. That's not terrible battery life, but it's not so great compared to other six-cell netbooks like the ASUS Eee PC 1008HA, which runs for about six hours. We did get a kick out of the bundled voice recognition software: we commanded it give us the weather in New York and it brought up a weather map within a few seconds. We almost wrote this paragraph without complaining about any preloaded software at all, but that was until ASUS' preloaded screen saver started up with hold-type music in the background. Seriously -- remove this crap before you do anything else with this laptop. The 1201N is a new type of netbook -- although we aren't even sure it should be called a netbook, since it's more like a full-fledged laptop. 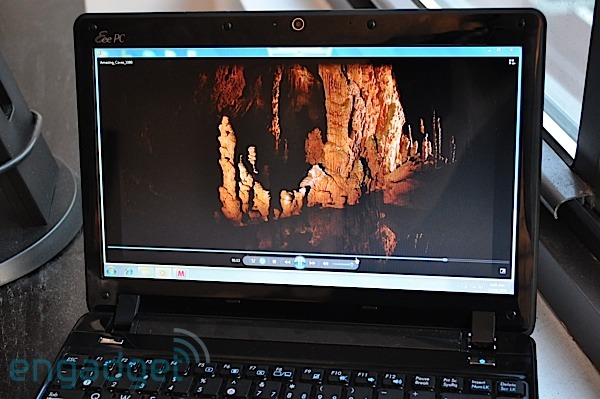 Regardless of what you call it, at $499 the Eee PC 1201N quelled our netbook frustrations by delivering a more comfortable computing experience and far superior multimedia performance than its 10-inch brethren. It offers neither the stamina of a netbook nor the performance of a $600 ULV laptop, but it's a solid compromise between the two, and we're extremely happy with it. Just make sure you pack a spare battery or two.